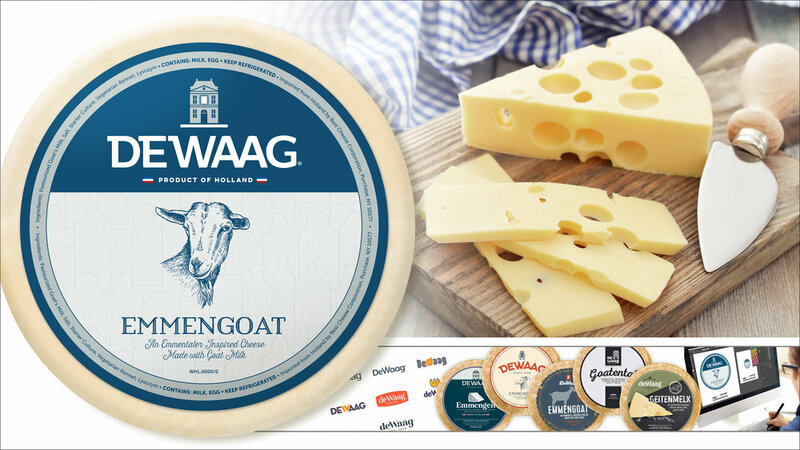 Best Cheese Corp USA approached Product Ventures seeking both a logo for their DeWaag brand, as well as a name and packaging for their new Goat Milk Emmentaler cheese. Typically, emmentaler cheese is made from cow’s milk, making this product’s goat milk composition unique. The chosen name “Emmengoat” allows this product to stand out among its other premium competitors, proudly displaying its distinct quality. Being introduced to an American audience for the first time, it was important that the brand be seen as fresh and current, while still encapsulating the classic touches of Holland. From the traditional flag, to the historic Weighing House, this design authentically displays the brand’s heritage in an eye catchingly modern way.